Deep and intensely captivating from the first page, ‘Conversations among Ruins’ is a semi-autobiographical psychological thriller/drama/romance composed of two distinct parts: the deterioration of, and the redemption of Daniel Stavros. Daniel Stavros is a professor at a small university who has both an out of control drinking problem and a mood disorder that seems rooted in his difficult childhood and his aberrant relationship with his troubled mother, Sarah. The tale opens in a detox ward. We learn that Daniel, though in utter denial and fiercely determined to continue his self-destructive path, is in danger of losing his job. Arriving in the institution is Mimi, young and overtly carefree daughter of a wealthy lawyer. Here begins an intense, sometimes dysfunctional romance that abets Daniel’s downward spiral. Peters’ writing is richly descriptive. We do not just witness Daniel’s descent into utter depravity, we live it. We feel what Stavros feels. We understand his pain. Mimi is not without her own similar troubles, but hers are more in control. So she is there with him, propping him up as he descends, until at last she becomes his only link to sanity. And then she dumps him. Part two, though not formally identified as such, begins when Stavros’ empathetic boss hands him a key to an isolated mountain cabin during a poignant scene in which Daniel barely clings to reality. Or perhaps he doesn’t. Part two is figurative and surreal. There is an almost Alice in Wonderland quality to the succession of scenes—a flow that feels like an amusement park ride. Where will the ride stop? Will the roller coaster derail? Well, I can’t divulge that, of course, but I assure you, the ride is worth the price of admission. 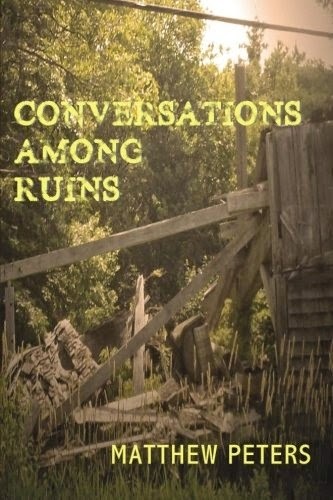 What a wonderful review, PJ of Matthew's new novel, Conversations Among Ruins. The book sounds fantastic. And Matt is an excellent writer. Thanks for the kind words, Susan. It's not hard to write an inspired review when you believe in the book. It is good fiction with a message and a promise of hope.